I have declared it BREAKFAST WEEK this week and I hope to share with you a few more of my favorite breakfast recipes. Earlier this week I shared a “recipe” for English Muffin Breakfast Sandwiches which are easily adaptable and can be frozen and reheated for quick breakfasts all week long. Love it. I have a fondness for vanilla and especially for those dark specks of vanilla bean. Growing up Dad would sometimes have Mom pick up a tub ofÂ Breyers Vanilla Ice CreamÂ and we knew we were in for a treat. It always tasted almost as good as my Mom’s homemade ice cream but the vanilla bean specks made it rememberable. None of the other vanilla ice cream we ate had them and none of the other ice cream tasted as vanillay as that Breyers. Mmmmm. The smell of the vanilla is irresistible. Kasper (who loves to smell things) kept sticking his nose up to the baking sheet saying “they smell so yummy Mommy.” He is right. They do smell so yummy. Vanilla lovers will love these. If you are planning on eating them right away glaze them after they have cooled slightly. However, if you are planning on freezing some of them hold off on glazing until you have reheated them. You can whip up the glaze and store it in a small jelly jar in the fridge until you are ready to use it. 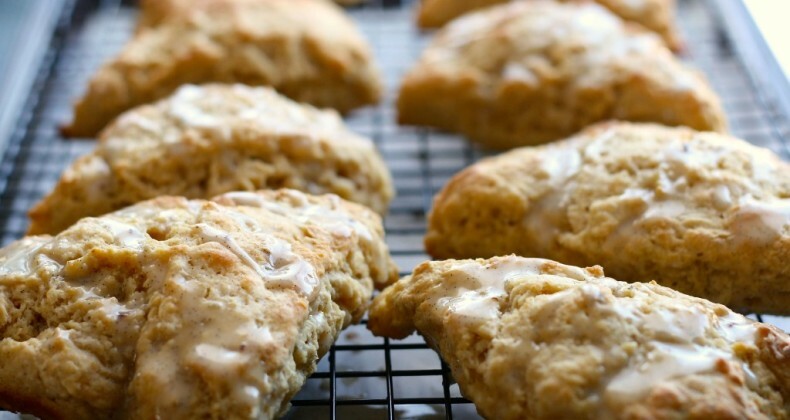 Pull out as many scones as you need and let them thaw overnight on the counter. Or you can pull one out in the morning and pop it in the microwave for 20 seconds. To freeze: Allow them to completely cool the pop them in a ziplock freezer bag. Wait to glaze until after you reheat them. 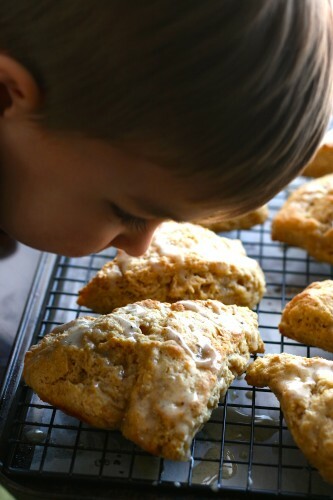 To reheat: Pull out as many scones as you need and let them thaw overnight on the counter. Or you can pull one out in the morning and pop it in the microwave for 20 seconds. Glaze to your heart's content. Preheat oven to 375 degrees F and line a baking sheet with parchment or silpat. Set aside. In a small bowl whisk together the egg yolk and buttermilk. Slowly add to the flour mixture, mixing until it comes together to form a dough. You may not need all the buttermilk. Reserve for brushing on the scones. Scoop the dough out onto a lightly floured surface. Knead a few times for it all to come together. Cut into 8 wedges. Place wedges on prepared baking sheet. Brushing leftover buttermilk on the tops. Bake for 15-20 minutes or until scones are starting to turn golden. Remove from oven and transfer to cooling rack. Cool before glazing or freezing. Combine the powdered sugar, vanilla seeds, and extract in a small bowl. Add the milk one teaspoon at a time. Stir until smooth and you have reached your desired constancy. Too thick add more milk, too thin add more powdered sugar. 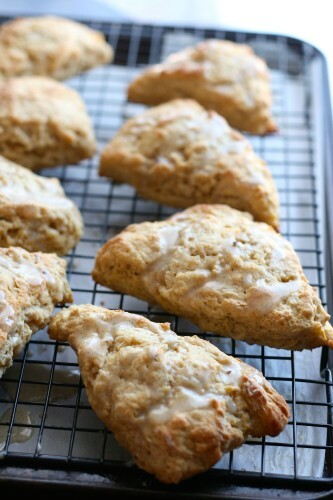 I have always wanted to try making scones, and these look delicious. And I love the idea of making them ahead and freezing them. For some reason I was intimated by scones. But it is easy as making biscuits! I hope you enjoy them. I feel the same way Dorothy! I think every week should be breakfast week!!! 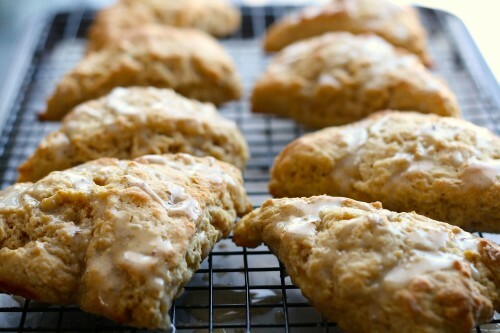 These scones look amazing. I have never made scones but enjoy buying them lol! Sounds like a perfect fall breakfast Debbie!